Following after beta releases for iOS 12, tvOS 12, and watchOS 5, the third developer beta for macOS 10.14 Mojave is now available for download to testers. Code for the new builds can be acquired from the Apple Developer Center, or for devices enrolled into the testing program, as over-the-air updates, along with the other three third-beta releases. A new public beta usually arrives shortly after the developer version ships. The third developer beta for macOS 10.14 Mojave replaces the second beta's build, numbered 18A314h. 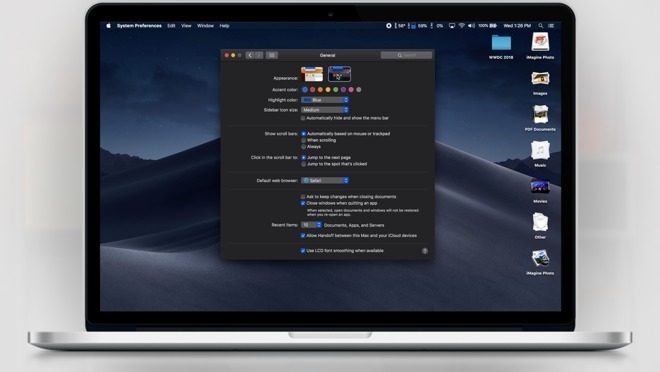 Apple has made macOS Mojave more useful for people who store their work on the desktop, with the new Stacks feature able to group files and images automatically. Changes have also been made to Finder, such as a Gallery view that shows media and metadata, and the addition of contextual quick actions that can be used to perform custom automator tasks on files. Quick Look has gained the ability to use Markup without needing to leave the menu, as well as making it possible to trim videos without using a separate video editing tool. The Screenshot HUD makes it easier to take images or video of the desktop, with it also claimed to reduce the load on the processor compared to earlier methods. The Continuity Camera can be used to insert a photograph just taken by an iOS device's camera into a macOS-based application, without needing to send it over with AirDrop or via other ways. Part of an ongoing project to enable iOS apps to work on macOS, Apple has started things off by making some of its self-produced apps work on the operating system. News, Stocks, and Voice Memos have been updated to work from iOS to macOS, while the additional Home app can be used to maintain HomeKit devices. The Mac App Store has been refreshed with a new interface, borrowing elements seen in the iOS App Store like video previews. Machine learning technologies Create ML and Core ML2, as well as a new Dark Mode, also make an appearance.